I have been born of goodly parents. What a blessing that is! I am so lucky to have these two as my parents and to have been raised by them-and still am being raised by them. I treasure every word that they have to say and any advice is welcome still after all of these years. Sometimes I have something to say for them-but not nearly what they have to offer for me! I was blessed to live with them while growing up and learn what I could from them. I am also so grateful for the love that they had for me and the love that they have, and show, one another. I thank my Heavenly Father everyday for them. 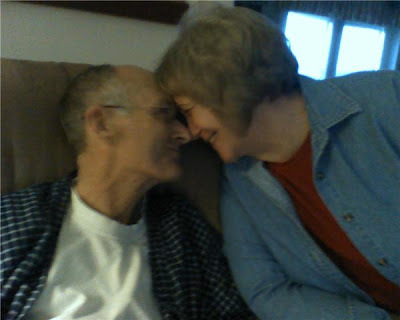 It has been difficult to watch them struggle the past few years with dad's illness getting worse and worse every year, but I have been blessed to be here in town to see the love that they have for each other grow even stronger! Was that possible? I am so blessed to have them as an incredible example that I would like to follow in my own life. The way that they conduct their lives and serve one another and others around them is an excellent model to anyone. Even now when dad's time is short, they know how to laugh, listen, share, live the gospel, and serve. Blessing #16-Goodly Parents! Amen to this blessing. Sometimes I feel so unworthy of my parents. My Mom is a saint & my Dad. . .well after missing him for 24 years I realize more and more what an exceptional human being he was. One day I hope to grow up and be just like them.